Cost effective walk-by monitoring systems for Fruit fly, Indian Meal Moth or Webbing Clothes Moth. Cost effective: reusable station, no electricity consumed. Inspection at a glance: placed on wall mounted surface or underneath bar tops. Plodia and Esphestia pheromone glue boards: slow release technology lasts between service intervals. 30 ml bait lure reservoir: at the bottom of station to add target pest lure. Add pheromone glue boards to any PestWest ILT glue board to increase attraction for target pest. Ideal for food processing plants and warehouses, hospitals, clinics, supermarkets, pet stores, restaurants, delis, convenience stores, schools, residential homes, and many more. A pure pheromone attractant absorbed on a paper coaster sealed within a peel-able pouch provides easy placement within most passive or pitfall monitoring traps. With Cluster Fly Lure convert a passive trap to a very active Window Wonder trap! A powerful calling-behavior pheromone attractant absorbed on a paper coaster sealed within a peel-able pouch provides easy placement within most passive or pitfall monitoring traps. With Asian Lady Beetle Lure convert a passive trap to a very active Window Wonder trap! Demi Diamond Trap – Safety Data Sheet. 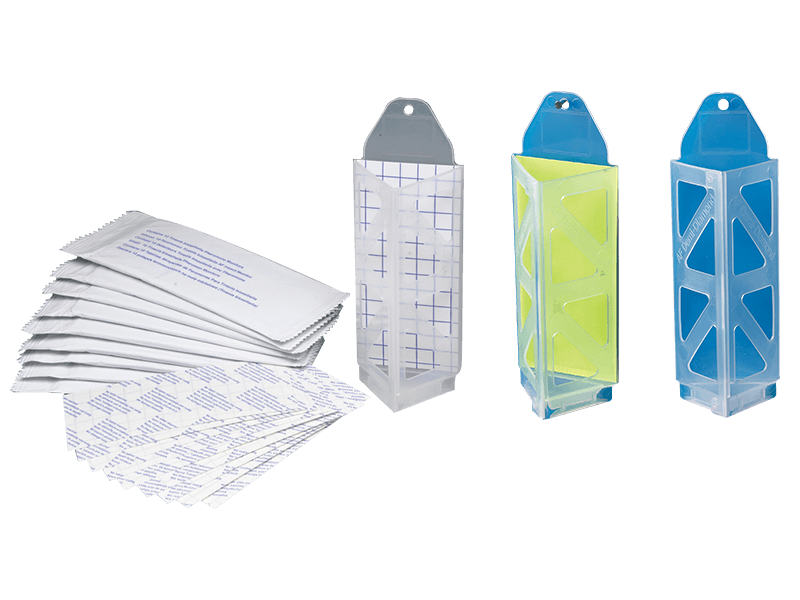 Fruit Fly Glue Pad – Safety Data Sheet. Asian Lady Beetle Lures SDS. Add your own bar code for tracking or a company label to personalize the monitors. The early detection of pests is critical in maintaining a pest free environment in food manufacturing, storage and retail. Most monitoring devices are inspected by the pest management professional during their routine visits, usually 4-6 weekly intervals. Problems can arise between these routine checks in that infestations may remain undetected. Walk-by monitoring encourages regular checks and quick inspection by both pest management professional and their customers, providing early detection of potential infestations. Systems should be placed in areas where they can easily be seen and inspected, at a glance, when just walking by. It is recommended that the walk-by monitoring systems should be placed in a grid system for effective spatial monitoring.